The weather on Earth can be pretty destructive, but aside from the occasional fire tornado, it’s mostly just water falling out of the sky. If you want really crazy weather, you need to get off this planet. The stuff going on around other planets and stars makes hurricanes seem like a soft summer breeze. Located 63 light years from Earth, the planet HD 189733b is a “hot Jupiter.” It’s actually 13 percent more massive than Jupiter but 30 times closer to its star than Earth is to the Sun. It’s the closest planet of its type to our solar system, and that means scientists have been able to figure out a fair amount about it. The surface temperature is 980 degrees Celsius (1,800 °F), and it has winds of 6,400 kilometers (4,000 mi) per hour. The extreme temperatures mean that its atmosphere is evaporating, causing the planet to lose up to 600 million kilograms (1.3 billion lb) every second. Though the planet is relatively close in galactic terms, we needed a clever trick to figure out its hellish weather. Scientists used the Hubble to pick up light while the planet was beside the star, then again when it had moved behind. 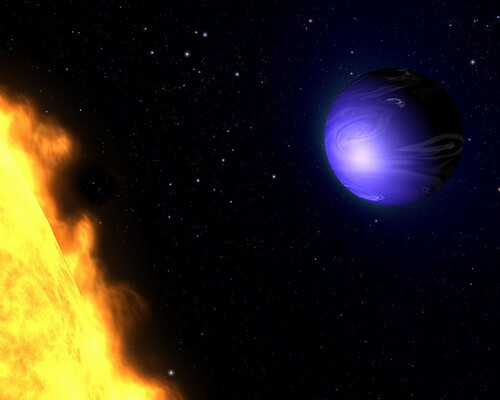 The change allowed them to figure out the planet’s color, which they dubbed “azure blue.” Like the blue color of our sky, HD 189733b gets its hue from light scattering in the atmosphere. However, this particular shade isn’t caused by air. The light is scattered by particles of silicate. That means that the surface is covered in rainstorms, but instead of water, pieces of glass move sideways at five times the speed of sound.